The first time I remember tasting risotto was the summer of 1999. Perhaps I’d tried this delicate Italian rice dish prior to that time, but it wasn’t until our “last hurrah” trip through Europe that summer that it truly made an impression. We had lived as expatriates in the Netherlands for almost three years and had agreed when taking on the adventure that “traveling” would be our one license-to-splurge. (Translation: if we were going to have any devil-may-care moments with regard to our finances, then it would be in our quest to see the sights.) While we tempered our gusto to hit the skies and roads until we had nested a bit, getting our kiddos acclimated to our new neighborhood, their school, and our new way of life, we made every effort during those three years to see as much as we could. The “last hurrah” trip, as it was quickly dubbed, was our final vacation before returning home to the States. While we had greatly enjoyed all the trips we’d taken, we had decided that this last adventure would be a road trip…no airports, cabbie stands, bus lines, or ticket counters for two straight weeks! Instead, we’d travel the wide, open road -- from the Netherlands, through Germany, Austria and northern Italy – right into the heart of Italy’s Tuscan region. It was on our return swing – going up through Switzerland, the Alsace region of eastern France, and Belgium – that I tasted this amazing risotto. This risotto was rich and creamy with just the perfect consistency to keep it from landing too far in the rice category, a culinary faux pas for risotto. (It requires, after all, a specific cooking process that must be followed in order to maintain the starch at the end of the cooking that will bind the grains of rice together as a cream…making it risotto and not simply rice). This particular risotto was laced with fresh, plump, slightly crisp, brilliantly colored green peas that tasted like they had just been picked from the garden and shelled moments before. It also had a slight onion, garlic and wine-infused flavor, intensified by a generous addition of parmesan and a swirl of extra-virgin olive oil. I was allowed just a few bites…after all, it wasn’t my meal…but that little risotto made a lasting impression. The funny part of all this is that it wasn’t until just a few years ago that I even attempted to make risotto. It had always been touted and presented at restaurants with such regard…”the chef is making risotto today”…as if it couldn’t be made just any old day. It requires time, patience and the right balance of ingredients. It was always a dish that the maitre d’ would inform the table would take a half hour to prepare and advised interested parties to make this selection early enough to allow it to be prepared in time to serve along with the other diners’ meals. And then, of course, a superior glow would slowly cast over those that had the culinary expertise to know this was the evening’s gastronomic “go to” item. While risotto has become more of a regular feature on menus in recent years, (meaning the introductory fanfare has ebbed), it still retains a certain star quality. It may start out as just a humble little rice, but it holds its own as a main entrée at many fine restaurants. After finally shedding my self-proclaimed fear of risotto-making a few years back, I attempted my own and found that while it does require some time, patience and the right balance of ingredients (like most all good dishes), it is not difficult. I think the time factor is what might scare people off. You definitely stay with your risotto, stirring and adding the liquid and flavorings as it develops its consistency, ensuring that it maintains that all-important starch. But it’s well worth it…and, again, not difficult. 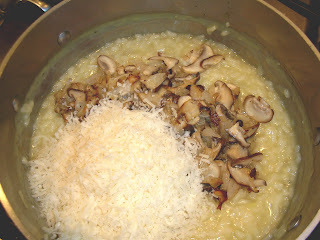 How you “dress” your risotto is also key, in my un-trained opinion, to making it go from good to impressive. I think cooking the arborio in chicken broth and a little white wine (something on the dry side that you’d actually drink) adds a rich foundation. And, of course, a generous addition of a good parmegiano reggiano cheese is a must. 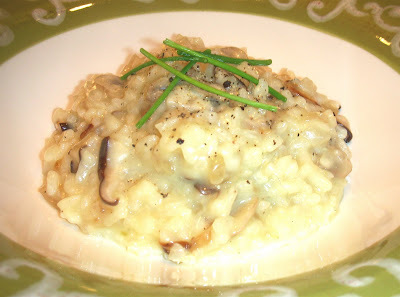 My absolute favorite is Mushroom Risotto. While I’ve served it as an entrée, I particularly like serving it as a starter. Risottos are, by their very nature, rich and filling…a little goes a long way in my book. So unless I plan a simple meal where I pair it as the “star” along with a great salad, to balance its wonderful richness, I really like plating it up as a starter. Either way, it is sure to make a lasting impression! 1. In a small pan over medium heat, saute 1 cup diced onion in butter. 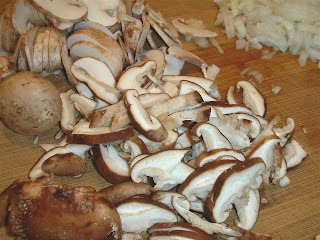 When lightly translucent, add sliced mushrooms and continue cooking until cooked through. Season lightly with salt and pepper and set aside. 2. Heat chicken stock in glass measuring cup in microwave, or in pot on stove, and set aside. 3. Heat olive oil in a heavy non-stick pot (at least 2 quart size) over medium heat. Add 1/2 cup onion and saute until translucent. Add arborio rice to onion and stir until grains are coated with oil. Add wine and stir constantly until wine is absorbed. 4. Add 1 cup of hot chicken stock to arborio, stirring until liquid is absorbed. Continue cooking and adding stock (one cupful at a time). This will take approximatley 20 minutes. Stir consistently and wait until liquid is relatively absorbed before adding each additional cup of stock. The rice and liquid will create a creamy sauce as you go along. Add additional stock if mixture gets too thick. Remove from heat. 5. Stir in parmegiano reggiano cheese and mushroom mixture, until heated through and cheese melts. 6. Plate risotto, sprinkle lightly with a touch of black pepper and snipped chives.